Spring is on the way and Easter brings all the childhood memories of coloring and hunting for eggs, chocolate bunnies, and those divine Easter dinners with family and friends. 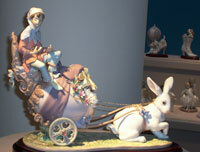 For gift givers, I recommend the beautiful spring inspired ceramics at Lladro. The Spanish based company that began in the 1940s has galleries and centers throughout the world, and a magnificent art piece for every occasion. The Lladro Center Beverly Hills displays thousands of the unique ceramics in their showrooms, and the founding family visit often to help provide new ideas and greet loyal customers. The philanthropic company supports many children's charities, and in May Svend Ingerslev, the Director of Lladro on Rodeo Drive will be presented an award by The Jeffrey Foundation, a nonprofit organization in its 33rd year providing child care programs, and counseling for special needs children. Some tips on a few of my favorite restaurants in Europe and in the US appear in this issue, along with news on yet another super spa for your enjoyment. The Maui Visitors Bureau paid stopped in our town and presented a most unusual dinner for the LA travel writers; details appear in Epicurean Events this month. Book Bites gives you a look at some sensational Hollywood beginnings and endings, and Cody Hilton, LBN cub reporter for Kids Kaleidoscope, has submitted a story on a popular tourist attraction in Los Angeles. April brings you a variety of additional stories and recipes, including a review of The Four Seasons Hotel at Beverly Hills, where Executive Chef Conny Andersson's culinary skill delights guests. Please register with us this month and feel free to contact us with any questions regarding online advertising in Bonnie Carroll's Life Bites News. Our advertising rates are competitive, and provide visibility with an audience of readers who will take advantage of your products and services.